Welcome to the Walks of New York blog! We launched our blog to help travelers experience the best that New York City has to offer. After years of living and working in the city, we think it’s fair to say we’re NYC experts. And we want to share our expertise and passion for the city…with you! We think you’ll find that our emphasis on this blog — as with our walking tours themselves — is to help you discover and explore New York City at its finest. We share the city’s culture, history, popular sights and hidden gems. So we hope you’ll come here again and again to find honest information about traveling to NYC, from unvarnished advice to travel inspiration. If there’s anything you’d like to find on our blog, please email us. Have a question or reaction regarding one of the posts? Feel free to comment! And if you want the ultimate in personalized help when it comes to planning your trip to New York, contact our travel experts. They work around the clock to make sure you have the best NYC experience possible! 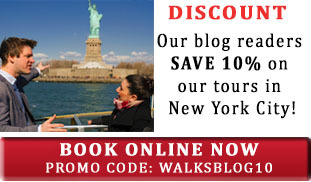 We’re happy you’ve joined us to explore and take Walks of New York — for more information and booking, visit walksofnewyork.com.